This is the story of a young child who would sit and watch his grandfather make a special spices mix at his ancestral home in the south Indian state of Kerala. His grandfather worked with eye-estimation and no fancy marked ladles. He could tell, at a glance, if a certain spice was in excess or short. This young child saw it all while inhaling the aroma of the spices. This is not a published story or a famous one. But when you dine at the award-winning modern Indian restaurant, Ananta, at the plush Oberoi Hotel in Business Bay, Dubai, you get to understand the story of spices and how well that little child imbibed what he saw his grandfather do. That little child, not little anymore now, is head chef Saneesh Verghese, at Ananta. Little wonder that this restaurant picked up the 2014 BBC Good Food Award as the Best Indian Restaurant – Fine Dine. Ananta puts down all the states of India on the diner’s plate. In rich hues of burgundy and warm caramel lighting, Ananta offers a generous view of the ‘tandoor’ section for all its guests to see how the tiger prawns and Indian breads come through. I have known and savoured the Oberoi Group’s hospitality while in India. It felt like home in the warm hospitality and careful hosting of the staff. You will not forget the smiling face of the restaurant manager Ricardo who pays a fine eye to all detailing while service is on. 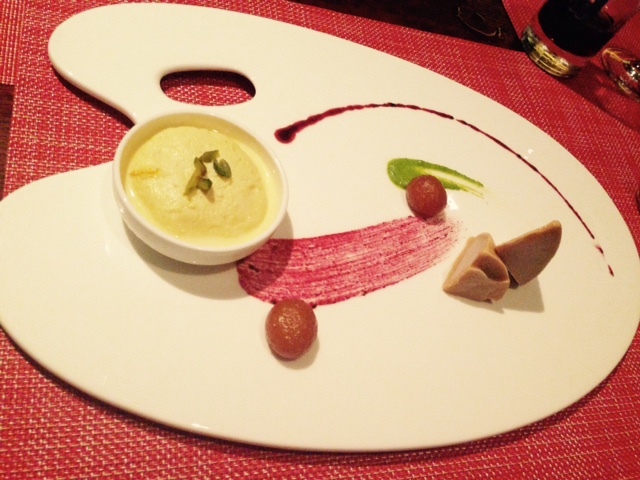 On my plate was the famed Dinner Thali and my wife opted for the Art of Ananta Degustation. 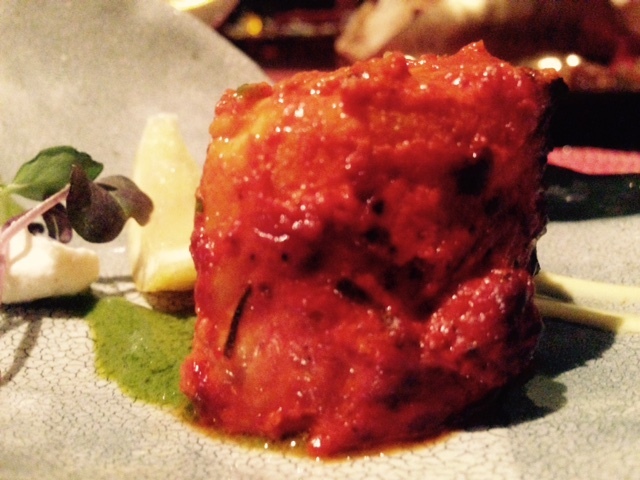 Chef Saneesh had me with the mild Kerala spiced tandoori salmon, served with a saffron chutney and mint. Have had variations of this in other restaurants but I am going to remember this one because of its flavouring. 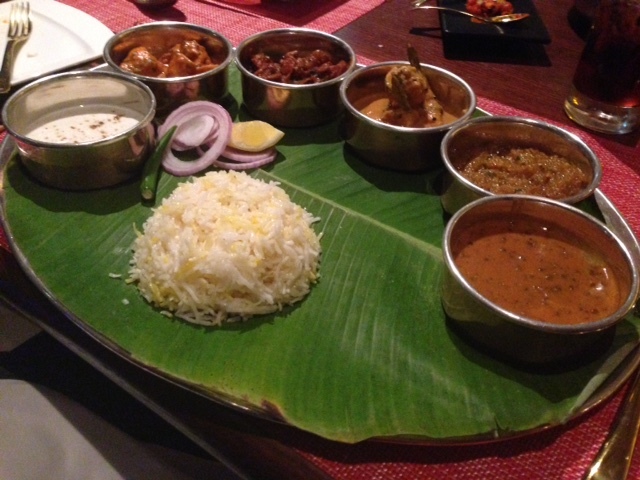 The other star dishes that stuck out on basis of imagination and assimilation of flavours was the 5 chutney and grills. 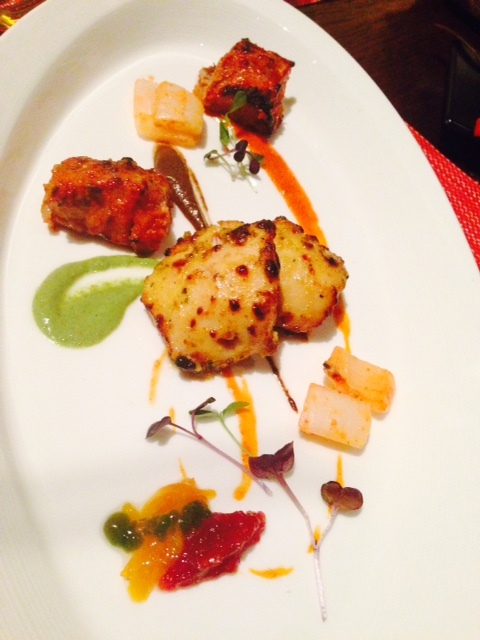 The meats were tandoori tiger prawns, chettinad chicken tikka and mutton seekh kabab. Those were served on artistic strokes of 5 different chutneys namely the black garlic and truffle (I licked that till the plate shone), Kumquat orange and curry leave caviar (the green dots in the picture), apple and pomegranate jam, mint and tamarind. The ‘thali’ came to my table after several rounds of savoury eats and a few that I stole from my wife’s tasting plate. When it sat in front of me, I was tussling up with myself as it looked no different from any other. There is only so much that you can do with a traditional ‘thali’. Therefore the real test lay in the taste. The silky planton leaf had a shaped lump of fragrant basmati rice with clarified butter and the accompaniments were butter chicken, Amritsari bhuna gosht, prawn Malabari curry, lauki ki sabzi (veggie of the day) and dal makhni. 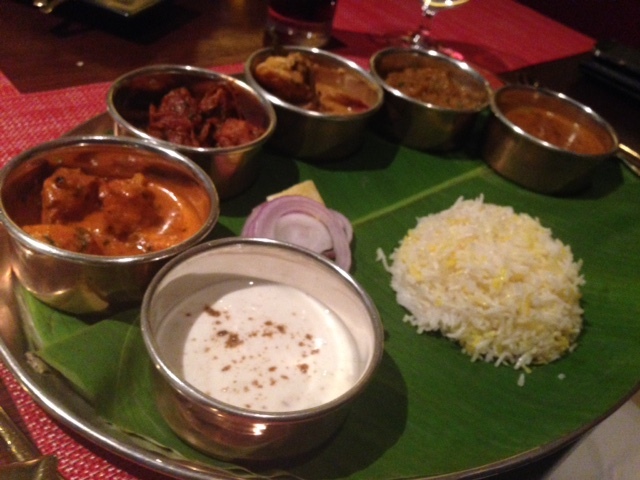 The thali took me from North to South India with every morsel of butter chicken and prawn Malabari curry. In my head, the Amritsari bhuna gosht made me drag out a few bragging restaurateurs to tell them ‘this is how it is made’! The masalas were rare and the mutton was soft as mash. Those that know me personally, know that I judge eateries on the dal they make. Oberois knew that trick for years. This dal makhni healed my heart for missing out on traditional dal makhni in India. Magician Saneesh got us ‘wowed’ with his pista sesame naan and the very ‘un-put-down-able’ cheese ‘n’ truffle naan! I was almost asking for a lifetime supply of the latter. 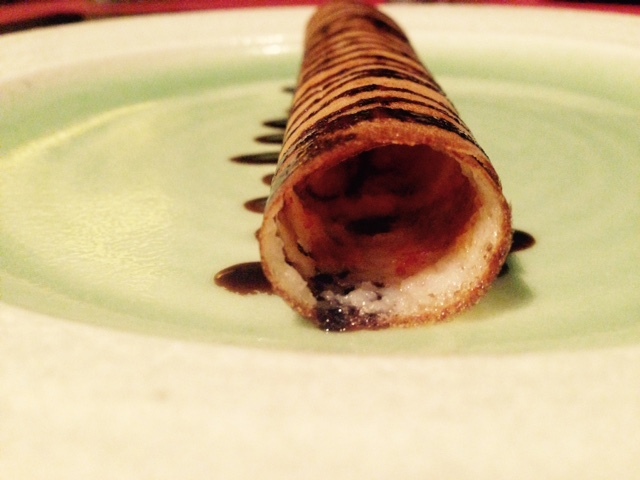 A fancy palette cleanser was a mini dosa with the ancient recipe of chocolate with chilly. Piece de resistance was dessert that did a fine impression of an artist’s colour palette. The colours had ras-malai, gulab jamun and kulfi. The finale is high-point of fine culinary aesthetics. Ananta is one place to indulge, recurrently – till infinitum. Previous PostThe Man Behind The Fame – Vikas KhannaNext PostBloomsbury’s Artisan Bakery – for your cup of joy!